Members of the Lady Margaret Boat Club, May 1897. By twelve members of St John's College, LMBC was the first college boat club in Cambridge. In its original rules, the Club was to "consist of eighteen contributing members, besides honorary ones", and all members had to be able to row. An early member was Patrick Colquhoun who, in 1837, instigated the Colquhoun Sculls, in the year in which he won the Wingfield Sculls. The greatest influence in the 1860s and 1870s was J H D Goldie, who raised LMBC to the "Headship of the River", won the "Colquhoun Sculls", and stroked Cambridge four times, before captaining the Leander Club. The Goldie Boathouse, built in 1882 and still used to this day by the University crews, commemorates his services to Cambridge rowing as does the University second VIII+, officially known as the Goldie Crew which competes annually against Isis just before the University Boat Race. © Carlson Media Inc, from Rowing Blazers. 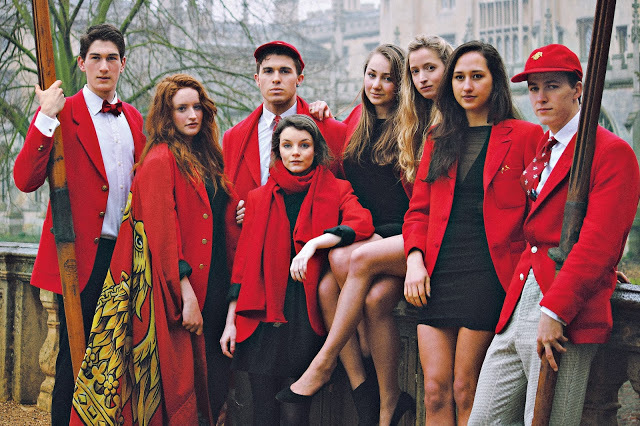 The term 'blazer' originated with the red 'blazers' of the Lady Margaret Boat Club. The Boathouse was opened in the Easter term of 1901. It was extended in the 1970s, and was the first college boathouse to have a workshop for the boatman. In the early 1980s, when the college began to admit women, further modifications were made upstairs to create the women's changing rooms. The boathouse was extended further in 2000 to create more indoor training space. The Club's heyday was in the late 1940s and 1950s. LMBC won the "Ladies Plate" in 1949 with a new course record. In 1950, they made 4 bumps to go "Head of the Mays", and stayed "Head" for five years. In 1951, Lady Margaret won the Grand at Henley Royal Regatta and had five members of the successful Cambridge crew, which also defeated Harvard and Yale in the United States. Between 1975 and 1981, Lady Margaret were Head of the Lent Bumps for 26 consecutive days, the longest continuous defence of the Lent Headship. LMBC last held the Men’s May Headship in 1989, and the Women’s May Headship in 1992. During the 2000s the club remained one of the most competitive in the University. The Lady Margaret’s 1st Men’s VIII returned to its positions as head of the river for the Mays in 2016, and the Lents in 2017.